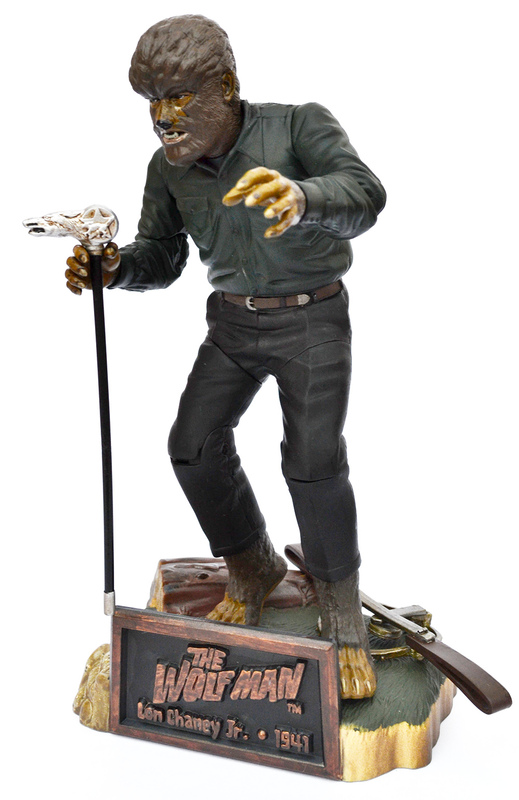 Universal Studios Monsters: The Wolf Man action figure by Sideshow Toy (1999) | 'TAIN'T THE MEAT… IT'S THE HUMANITY! Universal Studios Monsters was a collection of 15 action figures released by Sideshow Toy between 1999 and 2001. The collection featured some of Universal Studios most iconic movie monsters — Frankenstein, Dracula, The Mummy and The Phantom of the Opera, to name but a few — and celebrated the actors who portrayed them. 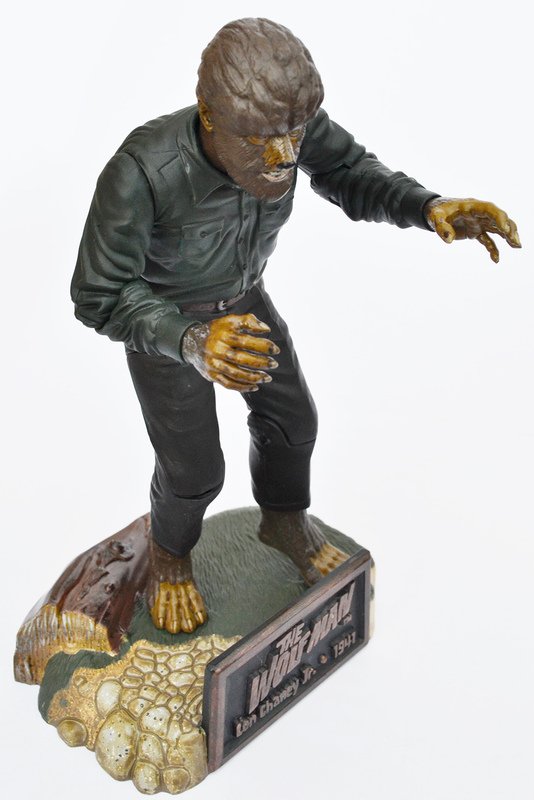 This week it’s the turn of the second figure from Series One of the collection: Lon Chaney, Jr’s The Wolf Man. The Wolf Man was released by Universal in 1941, and was in fact the second werewolf film by the studio — the first, Werewolf of London, 1935, wasn’t a great success. The Wolf Man told the tragic tale of Larry Talbot, who returns to his ancestral Welsh home after the mysterious death of his older brother, and attempts to reconcile with his estranged father (played by Claude Rains). After being bitten by a large wolf (in actuality a cursed gypsy played by Bella Lugosi) Larry becomes a werewolf and begins to terrorise the small Welsh village. The film ends tragically when Larry‘s father beats his son to death with his own silver wolf-head cane. The film was a hit and created a new horror icon in The Wolf Man, while turning Chaney, Jr into a bankable star, who would go on to play the character in four more sequels. 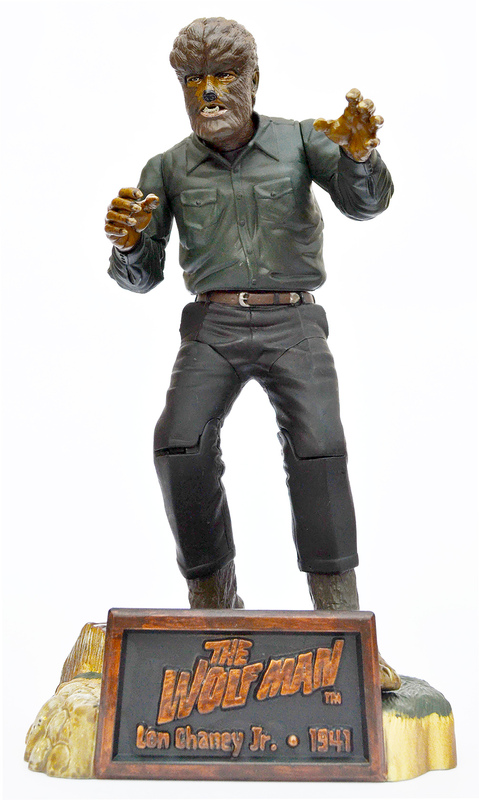 The Universal Studio Monsters action figure of The Wolf Man measures a little over eight inches in height, and is made from sturdy plastic (the figure is probably the heaviest of all the action figures in the collection). The figure boasts 12 points of articulation and shipped with two accessories: a wolf trap and Larry’s silver wolf-head cane. The figure also came with a moulded base and name plate that featured the film’s legend. The action figure came with two accessories: a wolf trap, and Larry’s silver wolf-head cane. The action figure was based on a sculpt by Oluf W. Hartvigson, who also sculpted the bulk of the figures in the collection. Hartvigson did an admirable job with The Wolf Man as the figure greatly resembles Chaney, Jr, and there’s a nice sense of menace in the monster’s pose. The paint job on the figure is also well done with some nice colour shading, particularly on the face and feet. The action figure shipped in a cardboard-backed blister-pack, the back of which showed the other two figures from Series One: Frankenstein, and The Mummy, both portrayed by Boris Karloff. The Wolf Man, from all sides. In my previous post on the Frankenstein action figure I noted my fondness for this particular collection of action figures — they easily rank as some of my favourites in my collection. Not only are they very well made, and feature great likenesses of the characters, they look great when all lined up on a shelf. The Wolf Man, with his accessories. Considering the age of these action figures it’ll come as little surprise that they are no longer widely available. You can still find them eBay and Amazon Marketplace, but they’ll set you back anywhere from £25-£60, and even more for some of the rarer figures (particularly those from Series Five). 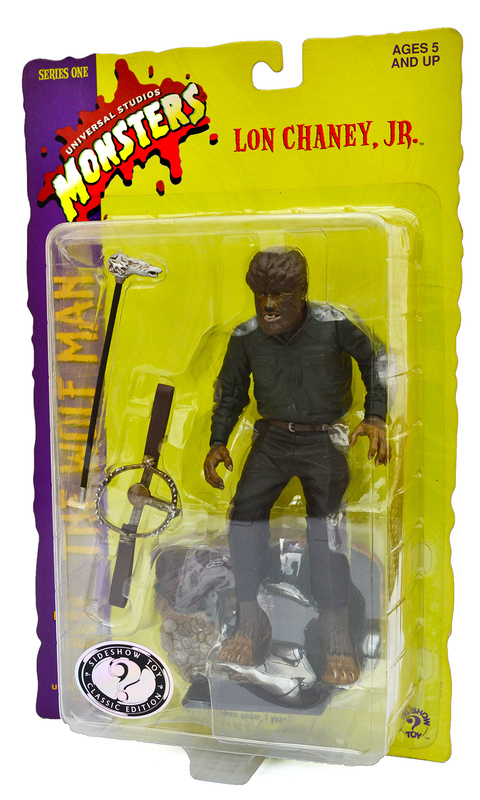 Along with this standard coloured version (labelled as ‘Classic Edition’ on the packaging) Sideshow Toy also released a black and white Silver Screen Edition of The Wolf Man, but I much prefer the colour version. The colour just adds a certain something to the figures that the black and white versions lack (frankly, I find them a tad dull). 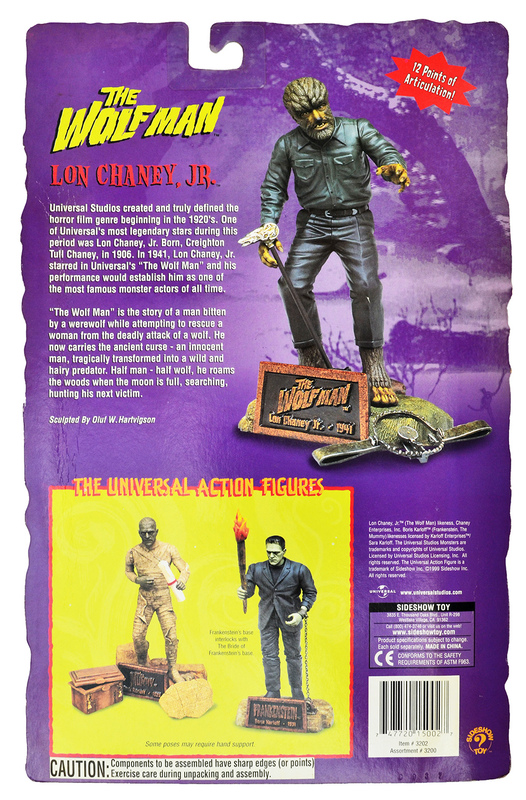 All-in-all this is a great action figure and one that pays homage to a true icon of horror cinema. For fans of The Wolf Man it’s well worth hunting down. Next: Boris Karloff’s The Mummy.